Water Efficient Toilets: How Do You Know If It “Works”? 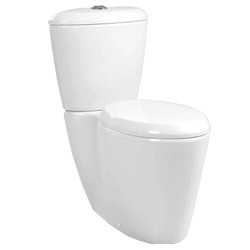 it does the job – the days of two+ flushes should be long, long gone. 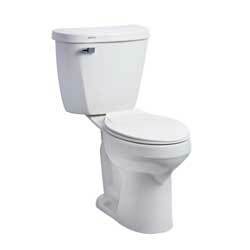 Water saving toilets have historically gotten a bad rap for blah design and even lower performance. But water-efficient toilets are the standard these days and that means there are many modern toilet designs with super water savings and—bonus!—many are made in the U.S.A. Here’s a handy little guide to choosing a water efficient toilet that works for you. 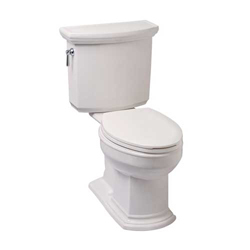 A little necessary background: Before 1993, toilets used 3.5 gallons per flush (gpf). In 1994, all new homes were required to have water efficient toilets that averaged 1.6 gpf and now high-efficiency toilets (HETs) go as low as 1.28 gpf, with some even using as little as 1.0 gpf. Did you know the average person flushes 5 times per day? Go check your toilet and see how much you’re using with every flush. (It’s under the lid or sometimes it’s visible on the ceramic near the brand name). Now, go over here to our handy water savings calculator and do the math on what that means for your wallet. The average family of four can save $64 per year making a simple switch from a 3.5 gpf to a 1.28 gpf. (And for even more savings check into local rebate programs.) Even better news is for your kids and their kids and their kids—you’ll save over 16,000 gallons of water each year. Just imagine, a whole neighborhood block could save over 300,000 gallons of water each year. And 300,000 gallons is about a years worth of water for the average family. Meaning for every twenty houses that trade in their old clunker for a new water efficient toilet, that’s the equivalent of one less family using water in the world. So, your first step is to decide if it’s time for a water-saving change and how low you want to go. Hint: it really does make sense to go as low as possible. But what about design? Affordable water-saving versions of contemporary toilet designs aren’t all that rare anymore. It’s no big deal to find a water efficient toilet that looks good in your sparkly new bathroom. Look at this range of designs from around $200-$400*. Water efficient, stylish, and effective: the modern toilet trifecta. It works. *These are manufacturer list prices. You can expect to pay less in most cases. Just locate the dealer nearest you on our website and call for a price.